Home Other Articles Gibraltar: Where Is Gibraltar and What Is It Known For? Gibraltar is a British overseas territory located on the southern end of the Iberian Peninsula at the entrance of the Mediterranean. It is a peninsula of 6.843 square kilometres (2.642 sq mi) whose isthmus connects to the north with Spain. The Rock of Gibraltar is the major landmark of the region. At its foot is the densely populated city area, home to almost 30,000 Gibraltarians. An Anglo-Dutch force captured Gibraltar in 1704 during the War of the Spanish Succession. The territory was subsequently ceded to Britain by Spain under the Treaty of Utrecht in 1713. It became an important base for the British Royal Navy, which drove the local economy and provided employment for a large portion of the local population. 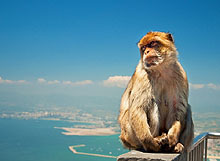 The sovereignty of Gibraltar is a major point of contention in Anglo-Spanish relations as Spain asserts a claim to the territory and seeks its return. Gibraltarians resoundingly rejected proposals for Spanish sovereignty in referenda held in 1967 and 2002. Under its 2006 constitution Gibraltar governs its own affairs, though some powers, such as defence and foreign relations, are reserved to the UK Government. The economy depends on tourism, offshore banking and shipping services.